A local man sustained various injuries in a hit-and-run crash Friday out on Out-on-the-Highway Road. According to Michiana Highway Control, a tractor driven by 47-year-old Cedric Z. Sedrickson was rear-ended around 2:45 p.m. by another tractor driven by an unknown agri-assailant. Sedrickson’s vehicle was forced into a ditch and collided with a tree. The perpetrating-tractor was seen leaving the scene at a low rate of speed. Sedrickson was taken to a nearby hospital (not this one) for treatment of minor cuts and abrasions, muscle-strain, a snapped femur, a torn hercules and a fairly major head-trauma injury to the head. His official condition was made unavailable by the medical center’s administrative department, but one health-care expert provided reassuring news. “Oh, I’m sure he’ll be just fine, in the end,” said the pre-med intern, who requested anonymity pending notification of his family. 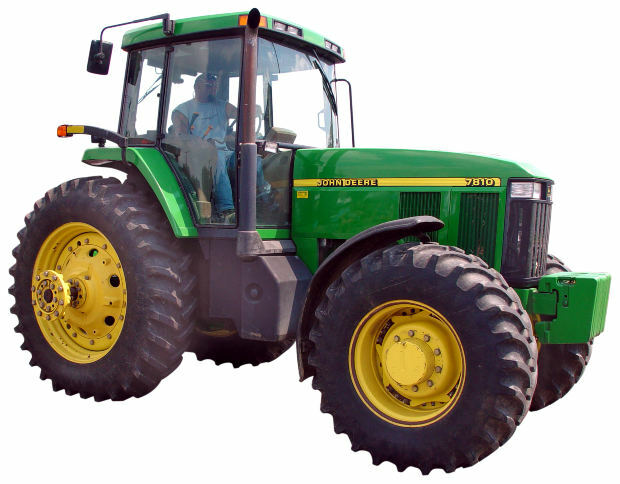 Meanwhile, authorities seek charges against the driver of the suspect tractor, which is described as about 10 feet high (at cab level), weighs 8,500 pounds and is John Deere in color. The Sedrickson tractor will be sold for scrap, a local farmer said.